That’s B as in Big Mouse. The fact is, the big bugs of night you’re waiting to hatch or drop don’t always do. Sometimes there’s a reason—evening temperatures fell too quickly, or a rain event chilled the river a degree or two too many. Sometimes there’s no reason whatsoever—that’s what makes it interesting, right? And sometimes, especially early in a hatch, there are bugs all over the place but not a single trout looking up. What’s a guy or gal who’s trekked in deep to big fish territory, drunk a bunch of coffee and waited patiently for dark to do? Swing waking flies, that’s what. Odds are if you are out after night bugs you are already in an area you know well. In terms of mousing, the size of of the water you’re on doesn’t matter at all. Small water mouses just as well as big, and brook trout are just as game as browns. In fact, three of the five largest brook trout I’ve ever taken were on mice (the other two were on hex). You’ll want to focus your efforts on big fish areas—those spots above, below and adjacent to a hole. Once there, you should focus on casts that kiss the bank—or actually go into the backside grass. Using strong tippet and a stiff rod will help you jerk that mouse free from the bank and into the water below—just like the real thing. Your decision as to type of fly should derive from three things: moon phase, current flow and temperatures. First off, the standard wisdom is that full moons favor lighter colored flies, new moons darker flies. This is not a hard and fast rule, but it will give you a basis for experimenting with what works on your particular watershed. Perhaps more important is how aggressively your fly wakes. In streams with faster, broken flows you need a larger fly that throws more of a wake if you want to get the fish’s attention. In slower flows, try a less aggressive approach. Again, experimenting in the daytime will help. In the event that you find yourself on a lake or a pool that is still as a lake, more will depend on the action you impart to it—you’ll use your rod and line to make the fly jitter and pop. Last but not least, temperature plays a part. In the Midwest, it’s not uncommon for nighttime temps to plunge into the 40s even during July and August. If you’re not getting any responses to waking flies, try larger streamers (such as a leech pattern) fished just subsurface. First things first. You’re going to want to experiment in broad daylight with how your fly lands and how it acts upon landing. 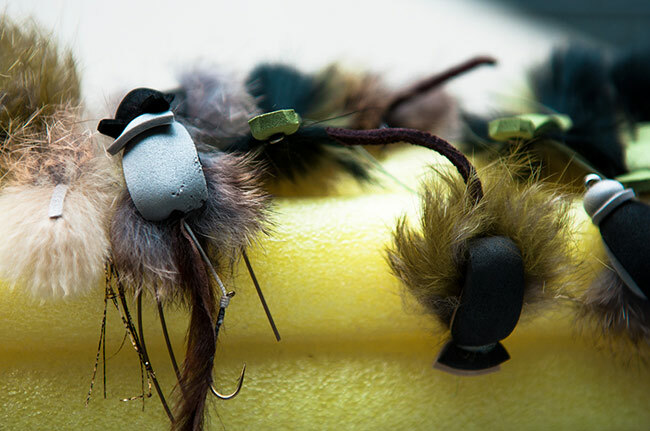 The first, and arguably most important, is how to “hang” your fly at the start of each cast. Ideally, we are looking for your fly to splat the surface and then do absolutely nothing. We want it to just hang there, in place, so that any fish in the vicinity has an opportunity to look up at the the point of impact and actually see something. If your fly splats and immediately starts choogling downstream and away from the bank, you’ve made it that much harder for a potentially willing fish to track it in the dark. Hanging is going to be accomplished with a reach cast, an aerial mend that allows you to reposition your fly line before it touches the water. Practice this cast in the day time; when mousing, it is your friend. The angle of your rod is also important while mousing. You’ll want to keep your rod tip pointed up at a 45 degree angle at all times, and you also want a slight bow in the line–tight connections are a no-go. This is because, prior to your arrival, the trout you’re after has been eating mice for years. And he knows that they can be plucked out of the film like a rotten grape from the vine—with little to no effort. With your rod pointed up, and some bow in the line, there’s just enough slack for a trout to get your fly in it’s maw. Once you hear a take, drop your rod tip and wait for the weight of a fish. Strip-set hard and it’s on. As for enticing that strike, make like Kelly Galloup and spend some time observing the action of your flies while you can still see them. What rod and line manipulations cause it to do what? A dead swing is not going to cut it mousing. As with streamer fishing, you’re aiming for an imitation of life, not a branch coming downstream. What do you have to do to give your mouse enticing action? When mousing, data comes through your ears, not your eyes. The first thing you’ll need to know is whether your fly landed on the bank or in the water. If you’re up on the bank, no problem. As mentioned above, just yank yourself free (I use 14 to 20 lb fluoro as a tippet). Obviously, you also use sound to detect your strike. And all strikes don’t sound the same. A small to mid-sized fish will often sound like a cymbal crash or a toilet bowl whoosh. Those sounds are easy—you don’t have to listen for them. But a more important sound is the ploonk of a large, mature fish who has done this before. This is a much subtler sound, but it bespeaks a much larger fish. Listen for it and respond accordingly—which means being a statue. This is not an easy thing to do. If you swing flies for steelhead, you know that in the beginning it took some training not to lift the rod when you got a meaty thumping tug. It can be even harder not to spring into a full-bodied hook set when, out of nowhere in the darkness beyond, you hear a sound like Andre the Giant’s custom toilet flushing. But the best night anglers are statuesque when they hear that sound. They don’t flinch. They wait, feeling for the weigh of the fish, and upon detection deliver two quick, solid strip-sets. So there we go. Even if the big bugs don’t show up, all is not lost. Carry an extra, stouter leader and a small bag of mice and see what kind of mischief you can get into next time you’re out in the dark and looking for a fallback plan.